This year I took the easy way out. Typically, we hand-make our valentines. But this year, our teacher specifically requested that we NOT do any Valentine’s with candy. To make my life easy, I just went and bought one of the Valentine’s box packages that came with 30 cards and stickers (x 2 – one for each kid). The boxes I got cost $2.99 each, so I was out-the-door for under $6. 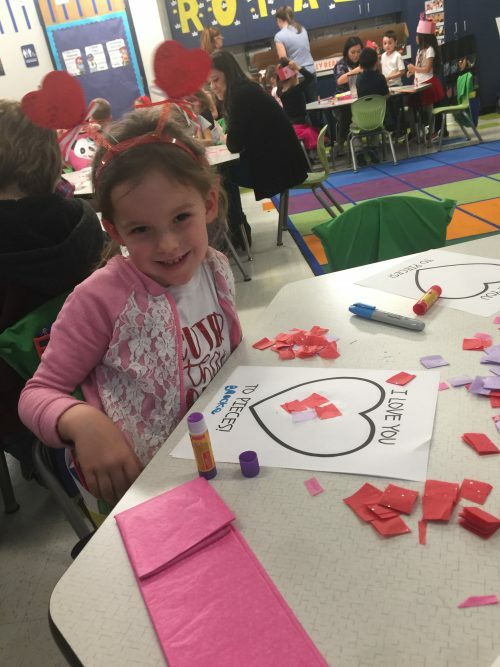 Instead of spending hours crafting and creating each valentine, we spent our time carefully handwriting each classmate’s name onto the card (in past years, teachers had always said just to leave the “TO” name blank, but this year we received a class list so we could address each card). Great reading/hand-writing practice, fun for the kids, and easy and simple for this momma! But that doesn’t mean we didn’t craft at all! The kids’ class had a Valentine’s party and our teacher asked for volunteers to bring in crafts to do with the kids. I volunteered, offering up one of the crafts we’ve done with the girls for a previous Valentine’s Day! I used a free printable and printed up enough pages for each student to have one (find printable here, original source here). I raided our gift-wrapping box and used tissue paper we already had (we had red & white), and I supplemented by buying a cheap pack of purple and pink (for 99 cents, each). I used markers and glue sticks I already had on-hand and my craft was complete! We had enough for the entire class and I’d only spent $2! Hubs and I were super low-key this year. We didn’t exchange gifts or go out to dinner. We got a $5 Hot and Ready pizza so I didn’t have to cook, and we watched a movie together after the kids went to bed. 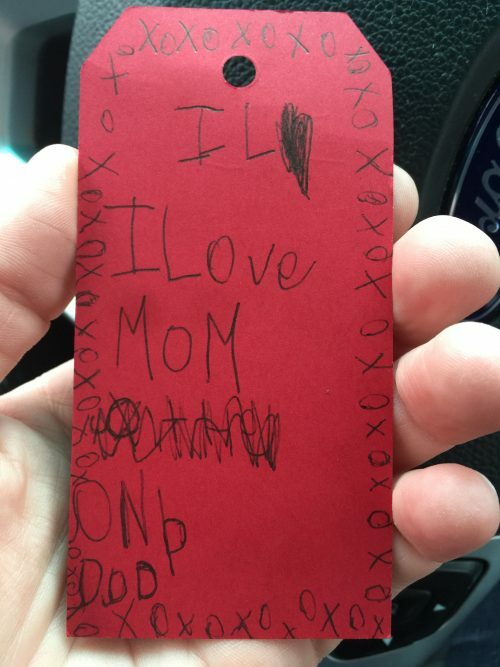 But, really and truly, I received my absolute FAVORITE Valentine (possibly of all time, ever) from my kid the day after Valentine’s Day. We were driving to school and when she got out at the curb, she handed this to me. I had no idea she was even working on this in the car on the way to school. Th scrap of paper is from our craft box. My kids are 5-years-old, so writing is still very new to them. This is the FIRST time that I’ve had her write something for me (or to me, really) without me dictating all the letters! My heart grew about 3 sizes and just about burst when I read: “I Love Mom and Dad!” (some typos, but you get the idea). Plus, the whole thing is lined with x’s and o’s for hugs and kisses! AAAAAHHHHHH, kids know just how to get you in the old heart-strings! I hope you all enjoyed a lovely and low-cost Valentine’s Day, too! Did you do any fun crafts or receive any special hand-made gifts from kids/family/loved ones?? FYI, you can get the same boxes of valentines at dollar tree. I also got treat bags and tiny boxes of stickers. We had to do 20 for day care and that’s a lot of writing for my three year old so she just did her first initial and I did the rest. I find that the majority of posts lately really aren’t related to debt payoff or budget tracking at all. I’ve noticed that too. I enjoy these snippets of the blogger’s personal lives, but in addition to the numbers posts, not instead of.